I don't often write tutorials as even though I have a beauty blog I don't consider myself an expert, I just really like makeup. However, one of the few areas where I feel I've developed some skills is covering breakouts and camouflaging spots. 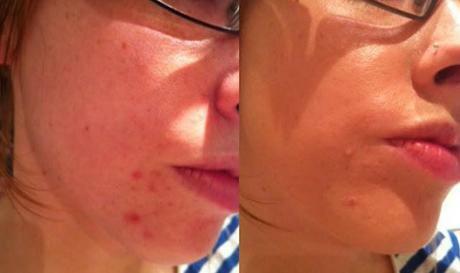 I've had spot prone skin for a long time and therefore I've spent over ten years covering up angry spots. This tutorial only uses products that are widely available on the high street. All you need is a primer, liquid foundation, powder foundation and a concealer. You can also use the same techniques to cover acne scars and temporary scars left by spots if they're still a little red and angry. ProductsHere are a few of my favorite products to cover spots, however you only need one liquid foundation and mineral one and a concealer. Find the right primerThe first step to concealing a breakout is to find the right primer for your skin.Primers often make me breakout but both Benefit's Porefessional and The Body Shops's Vitamin C Skin Reviver both work for me and don't aggravate my skin. A primer is important because it allows you to get an even finish for your foundation. This prevents makeup clogging on the spot prone areas, which draws attention to outbreaks and makes them look more obvious. FoundationFor spot prone skin it is a good idea to find a foundation that doesn't clog pores. I currently like Benefit's Hello Flawless Oxygen Wow as it gives good coverage and it doesn't sit in or clog spot prone areas. However, I'm not claiming this is the best foundation for spotty skin, I just feel it works for me. ConcealerFinding the right concealer is a must. You need a concealer that has yellow undertones as this cancels out the redness of the spots. Concealers with a pink undertone will highlight and therefore draw attention to the spots. I like ELF's Complete Coverage Concealer as it has a selection of yellow toned and pink toned concealers. A good yellow or green concealer is good for very angry breakouts, I use Jillian Dempsey's Professional Corrector Palette. Powder FoundationPowder foundations are important when covering spots because they help to set the concealer in place. The key to covering spots is to layer the concealer and powder foundation. There isn't much point applying concealer without setting it with powder because it won't stay in place. 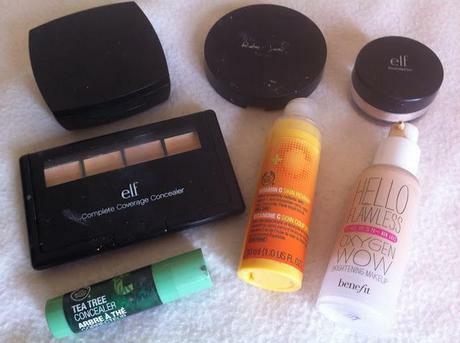 I like Elf's Mineral Foundation and Avons's Cream to Powder Foundation. 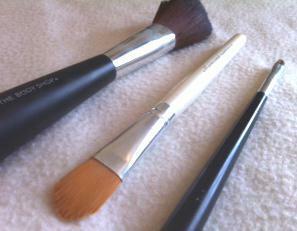 ToolsI use brushes to apply the liquid foundation, concealer and powder. Brushes are great for getting an even finish but you can use clean fingers. This is often the more hygienic option as it prevents you spreading the spots. If you use brushes they need to be washed regularly. I never use sponges. I find them difficult to use and they hold bacteria making it easy to spread spots to other areas of the face. TutorialTo achieve the finished result in the picture above I used ~ The Body Shops Vitamin C Skin Reviver, Hello Flawless Oxygen Wow, Elf Complete Coverage Concealer and Elf's Mineral Powder Foundation. 2) Apply your foundation with a brush all over your face. 3) If your spots are very red apply a yellow or green concealer directly to the spots using a concealer brush. Then set this using a light layer of mineral powder. 4) Choose a concealer close to the color of your skin and apply this to the spots to cover the yellow or green. Blend it so it blends in with the foundation. 5) Then cover this layer of concealer with a light layer of powder. 6) Keep repeating the process of using concealer and then powder on the spots until you are happy with the results A few fine layers of concealer covered with powder are much better than a thick coating. It looks better and doesn't look cakey and it holds for much longer too. I hope you've found that helpful!